VeryPDF PDF Table Extractor is built to extract PDF table data. With VeryPDF PDF Table Extractor, you can extract PDF table data to Microsoft Office Excel files and comma-separated value files. 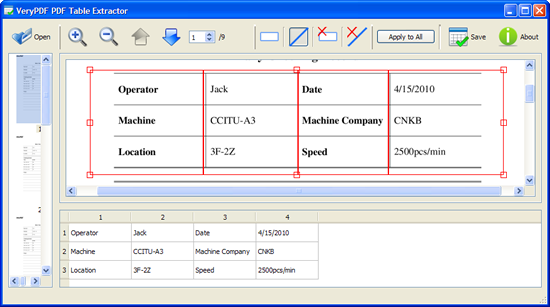 VeryPDF PDF Table Extractor provides some buttons to divide table columns in your own way. With those buttons, you can control the content in every Form. You can preview it in the application. 1. No need for other PDF software. 2. Support output format of Excel (.xls). 3. Support output format of CSV (.csv). 4. Preview the excel files before process. 5. Manually control table columns. 6. Export data of all pages with one template. With VeryPDF PDF Linearization Optimizer Command Line, you can regroup the elements of a PDF file, and make all the information for displaying the first page located at the beginning of the file. Senomix Timesheets for BlackBerry is the easiest time tracking software for design, engineering and other project-directed offices. Ready to work as a stand-alone time tracker or a front-end for QuickBooks, Peachtree or MYOB.